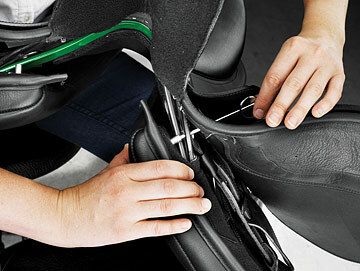 Remove the screw located under the skirt at the head of the saddle. 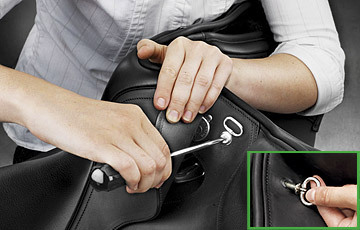 Some saddles feature a concealed system that unscrews using a D-Ring. Repeat this step on the other side. 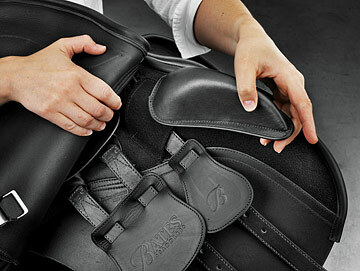 Locate the large tab folded under the head of the saddle in the chamber. This is held in place with Velcro. Untuck the tab from under the panel on both sides and lift it away from the tree – you will see your saddle’s gullet plate. If you have flexiblocs attached to your saddle, take them off. 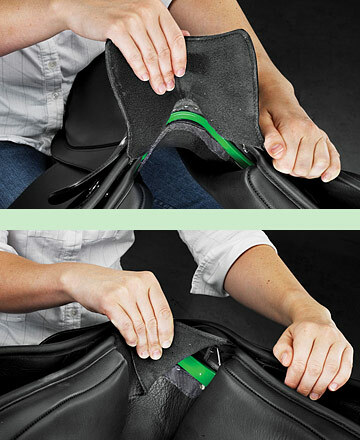 If your saddle has a point girth strap, you will need to release the Velcro tab securing it in place. Gently pull the panel away from the tree to free the steel post from the hole in the tree. Slide the panel down and off the tree point. Repeat this step on the other side. 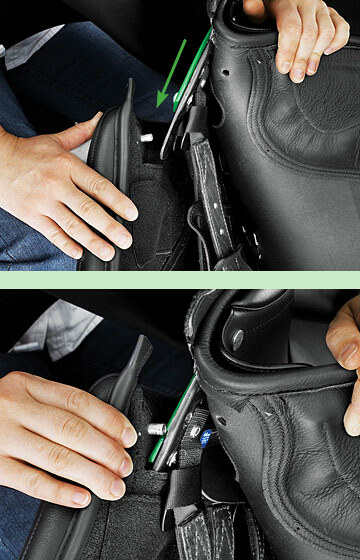 You can now see inside your saddle and are ready to change the EASY-CHANGE® Risers. 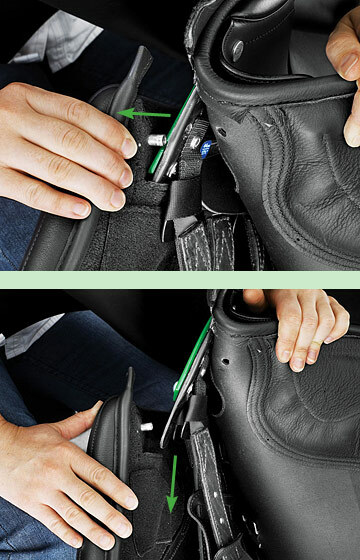 If you have adopted the standing position to make adjustments to your saddle on a table, rest the saddle on its side (with the panel facing you) when fitting your EASY-CHANGE® Risers within your panel. If you are making your adjustment seated, you will already have access to the full length of the panel. 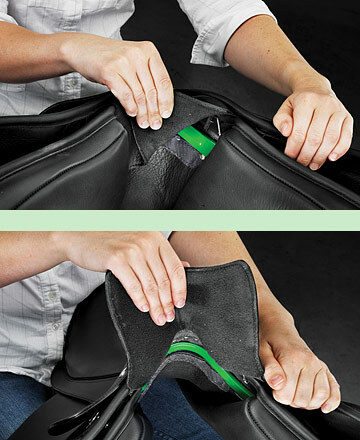 Undo the Velcro along the length of the panel to reveal the pocket. Position the risers in the pocket, with the EASY-CHANGE® Riser System logo facing towards the tree of the saddle. Align the straight edge of the riser along the edge of the chamber. Refasten the Velcro along the length of the panel to close it. Refit the panel onto the tree point by sliding the tree point into the point pocket to refit the panel over the tree point. 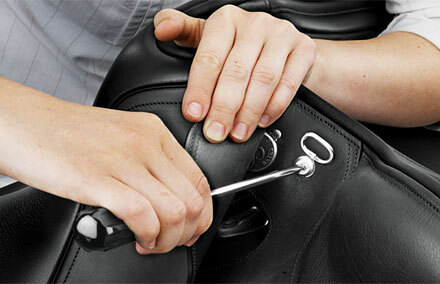 Insert your EASY-CHANGE® Locating Tool through the hole under the skirt of the saddle, through the hole in the tree and into the steel post. Lever the tool to locate the post and align by carefully pushing together. 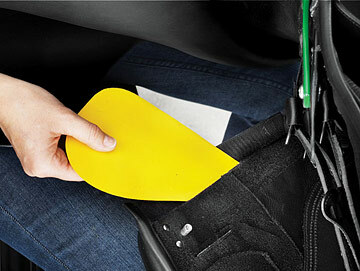 Holding the panel, tree and flap in place, remove the EASY-CHANGE® Locating tool and insert the screw and start it with your fingers, before tightening with the screw driver. Take care to ensure that the d-ring is positioned correctly at the end. Repeat on the other side. 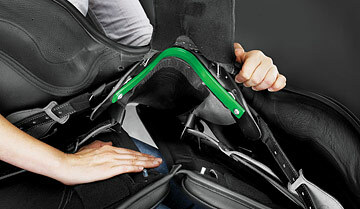 Tuck the large tab back into the chamber and under the panel on each side, taking care to ensure you have covered the two binding ends for a seamless appearance once finished. Remember to replace your flexiblocs on the saddle, and if applicable, secure the point girth strap under the velcro tab. To find your nearest stockist click on the logos above. Copyright © 2012 Bates Australia. All rights reserved.